Surging forward as they are driven by the powerful momentum of front woman Veronica Freeman - whose unique (if you call sounding more like a bloke for most songs unique) and powerful style has been called one of the truly most extraordinary voices in Metal - and the guitar pyrotechnics of writer and guitarist Pete Wells, the time has come for the world to be on notice. Benedictum is again upon us. Formed in 2005 and quickly noticed by Dio guitarist Craig Goldy, the wheels were soon set in motion for their great debut album ‘Uncreation’. Their driving music and energetic shows allowed Benedictum to grace the stage of many festivals including Wacken, Gods of Metal, HRH and a tour with DORO, with whom Freeman can now be talked about in the same breath as! Only Freeman has the much better voice. 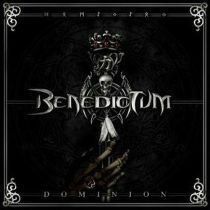 Benedictum are off on a new and exciting musical episode as they have signed a contract with Frontiers Records. Building upon their great foundation Benedictum has recruited Grammy Award winning producer Ryan Greene (Megadeth, 5, MXPX, NOFX) and are firing on all cylinders. With members Chris Shrum now on bass, Mike Pannone on drums and Tony Diaz on keyboards the new music promises to continue to expand the horizon for Benedictum and is sure to please current fans as well. Adding to the already explosive sound of Dominion are guest appearances by Jeff Pilson, Craig Goldy and none other than Rudy Sarzo on the fist pumping track Bang. One thing is for certain, Pete Wells prays purely at the altar of British metal, namely the likes of guitar Gods such as Iommi, The 2 Priest dudes, and Murray n Smith! Opening track ‘Dominion’ literally explodes into action, a blend of Dio, Dirksneider, and Rock(I couldn’t come up with another D beginning surname!). Power metal to blow away the strongest of cobwebs, this is an album definitely required to play loud to piss of the neighbours. The first few lines of ‘Seer’ and ‘Dark Heart’ allows you to listen to what Freemans natural (and quite cool) singing voice is, before her guttural trademark wail kicks in once again. ‘At The Gates’ shows Benedictum at their lightest, and ‘Prodigal Son’ has both feet planted in the RJD book of metal. ‘Epsilon’ follows in the same vein as ‘Valkyrie Rising’ and ‘Seasons Of Tragedy’ as their now staple EPIC number for each album. The last two albums have seen Benedictum cover songs by Dio-era Sabbath, and Accept. The trend for covers continues with a brave attempt to cover Rush's '2112' epic ‘Overture/The Temples Of Syrinx’. As a huge Rush fan, covering 'TTOS' is never going to be pretty for me as I’m so used to Lee’s tone and pitch. Freeman has a good stab at it, but she’d be better covering Dio or Quiet Riot. I’m not won over by this version, but it’s not a deal clincher as far as the rest of the album goes thankfully. Power Metal at its best!